So it’s 9:59 AM, you’re sitting in front of the Ticketmaster on-sale screen, watching the seconds count down to 10:00 AM, waiting for tickets to be released. You know you want to buy 2 tickets, but you’re not sure which section you’d like them to be in: General Admission or Reserved? Floor or Mezzanine? 9 times out of 10, your best option is to select “Best Available” in the Section column and let Ticketmaster make the decision for you. It’s silly to choose tickets way up in the nosebleeds when you have a good chance at grabbing floor seats. But there will be certain occasions when floor seats aren’t your best choice, and maybe even your worst. 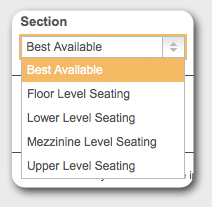 In these situations, you’re going to want to manually select which section you’d like Ticketmaster to select from. Think about it: If you’re a parent and you want to take your child to a show, would you really want to shield them from 500 other screaming fans? Or would you rather have the comfort of your own seat? Some fans also know that they won’t be able to wait in line for 8 hours to grab those first few rows on the floor, so they’re willing to pony up more money for seats in the elevated sections as long as they’re close to the stage. Everything depends on the show, so you have to make sure to do your research at least 20 minutes before the on-sale time. This applies more to non-GA shows. When a concert has a non-General Admission floor, tickets in the front floor sections will tend to cost a ton of money–way more than you might be able to resell them for. This ties back to what I think is the biggest rookie ticket broker mistake, as I explained in another blog post. Although there are some rare exceptions, you’re just not going to make all that much money from selling tickets that cost you $200+. Fortunately, though, tickets in the elevated sections are usually a lot cheaper than floor seats and if you manage to pull front row seats (or at least seats within the first 5 rows) in the elevated section closest to the stage, you might be looking at $500+ profits. So check ticket prices before you set out to buy, and if floor seats are just too expensive, select the next best section and hope for the first row. Before tickets go on sale to a show you’re targeting, you should check StubHub’s seating chart for that show to see which presale seats are already listed and up for sale. 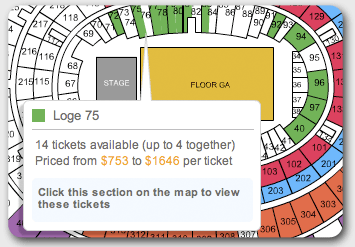 It may be that a huge chunk of the Floor is already on sale on StubHub before Ticketmaster releases them to the public. In these scenarios, the availability of good Floor seats may be scarce and you might want to try your luck at other sections first. Most fans/brokers will tend to leave the Section option as “Best Available,” so by switching to something less expensive, you might have a better chance at grabbing front-row tickets in elevated sections. The common denominator in all these examples is do your research! You’ll be more informed as to what section(s) you should be looking to get tickets and how much you’ll need to price them in order to make money from them. good informations. Do you have book? Hey, I really like yourself, its real informative for someone who is interested in the business! I know you say to compare prices of other sellers on stubhub and ebay, but I was wondering…do you mean the artist’s/teams last show/game? I’m just confused as how there could be possible sellers if they are not on sale yet. I’m assuming that your using stubhub and ebay to see what other sellers are planning to sell their tickets for once they have a chance as well to buy them from the presale. So I’m assuming your just gauging the activity or “buzz” of the event is producing to help decide whether its worth investing in? thanks a bunch! Next post: Ticket Broker “Secrets”: Are they for real?